It’s a wonderful name for a ghostly gentlewoman, isn’t it? Sarah Rayne, the neatness and primness of Sarah accompanied by the more sinister Rayne, with its rhyming connotations to darker, more unpleasant things. I came across the novels of Sarah Rayne, her ‘psychological thrillers of mesmerising suspense’ as her website states, through an iTunes recommendation. I’m very glad that the Apple algorithm goblins weaved their magic, because they’re fantastically, outlandishly good. 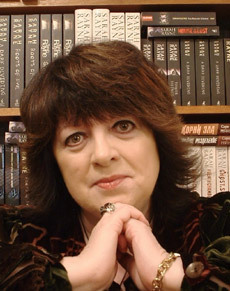 In a Sarah Rayne story, characters have their eyes plucked out by vultures on Indian hilltops (‘Tower of Silence’), shadowy things stalk derelict manor houses in abandoned villages (‘What Lies Beneath’) and prison doctors conduct secretive experiments on the murderous inhabitants of a Cumbrian gaol (‘The Death Chamber’). Nothing is too Gothic, too darkly bonkers for Sarah Rayne, and there is an enormous sense of Grand Guignol fun about her work. Her characters often enter altered states of insanity and paranoia, unable to control their actions, while the plots bounce wildly between the past and the present. It takes a very good author to control these kinds of twisty, turny narratives. Her writing is, like her name, sweetly prim and rather old-fashioned until the violence explodes in a fountain of blood.. Her characters also have the most wonderful names. Like (most obviously) Dickens, like my heroine Joan Aiken, Rayne knows that a good name shapes the character in the reader’s mind without the need for long descriptive passages. Lucretia von Wolff is the mysterious star of ‘The Devil’s Sonata’ whose death forms the mystery of ‘Roots of Evil’; Godfrey Toy is the polite, portly, poetry-quoting gourmand in ‘Spider Light’ and Philip Fleury is the bohemian Bloomsbury cad of an author in ‘A Dark Dividing’. My favourite character is Edmund Fane in ‘Roots of Evil’ – he’s prissy and devious and possessed by his dead father, but he’s a fantastic villain. Rayne’s characterisation also extends to the houses, villages and landscapes of her stories. Even places we may know well are seen through a portentous prism – her London is a city of small Bayswater hotels contrasting with grubby East End gin shops. Most commonly, her characters leave their neat little cottages with mullioned windows, walk through their country gardens where crisp golden leaves crunch underfoot, past the golden sandstone of the nearby church, and out into moorland or forest. Then, silent animal eyes watch the characters at their most vulnerable as horrible things happen. There’s a real sense of the menacing nature of the countryside, the wildness of things we can’t clearly see. It’s all beautifully imagined; a very complete, very English vision. If you’re looking for something different, something with a touch of Bunuel and a splash of Ann Radcliffe, then have a read of Sarah Rayne. I think you’ll rather enjoy it. I don’t know if you’ll get this. How do I reply to you? Hi Catherine – you can contact me through Twitter @amyebrittan or I can email you directly. Thank you!